MANILA -- The “Red October” plot is meant to force President Rodrigo Duterte to declare a nationwide martial law, signing his own political death warrant, the Armed Forces of the Philippines (AFP) said Tuesday. “The way we see it, the President is being dragged to declare a nationwide martial law, and also most probably a revolutionary government. That is the plan of the CPP-NPA (Communist Party of the Philippines-New People’s Army), to lead the president to a political death trap,” said AFP Chief of Staff, General Carlito Galvez Jr., during the Senate hearing on the proposed 2019 budget of the Department of National Defense and its attached agencies. Galvez said part of the communist plot to oust Duterte is to undertake a series of mobilization to heighten up agitation in the student and labor sectors including the indigenous people. He said the plan is to have successive mass mobilizations starting on September 21 up to December when the CPP-NPA celebrates its 50th anniversary. “It is a broad coalition plot wherein they will use existing issues like inflation and prices, and also depicting a government that will resort to dictatorship and tyranny,” he said. “In fact, they have already organized 10 of the universities in Manila and right now they are making a lot of information drive wherein they will show to all the high school and college students the atrocities committed during the Marcos regime and equate that to the present administration,” the AFP chief told the Subcommittee “E” of the Senate Finance Committee. The sub-panel is chaired by Senator Panfilo Lacson. 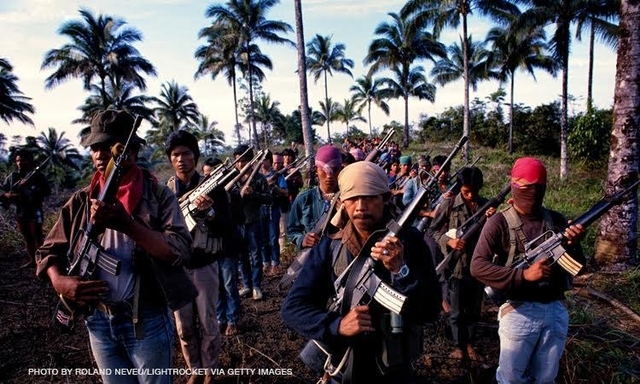 Galvez said the CPP-NPA has already hatched “Operation Talsik” and “Operation Aklasan”, wherein they will simultaneously conduct labor protests as well as tactical offensives in the countryside. He said “Oplan Aklasan” was unearthed by the AFP with the publication of the constitution of the CPP-NPA in 2016. “It is a very elaborate plan wherein they stated the heightening of the education sector using the First Quarter Storm model,” he said. “Actually, Joma Sison has conducted a lot of conferences with UP. We have documents, and we are ready to reveal them in executive session so that we can see the vast efforts of the CPP-NPA in order to oust Duterte,” Galvez said. Meanwhile, he added that the AFP publicized the said plot to preempt the mass recruitment, especially the youth, and the economic sabotage that will be undertaken under “Oplan Aklasan”. “They planned extensively on this and they will do their best to really oust the President. If we take this lightly, we might be like Marawi,” Galvez said. Galvez cleared opposition Senators Antonio Trillanes and Francis Pangilinan from the ouster plot. During the hearing, Trillanes categorically asked the AFP chief if he and Pangilinan were involved in "Red October". “Basically this is a sinister plot of the CPP-NPA. Kung makikita po natin talaga (If we can examine this), they would like to have a coalition with the opposition. That’s why our intention is really to protect yung ating (our) legitimate opposition,” Galvez said. “But based, Sir, on intel report Sir, while the CPP would like to forge a coalition, naki-pag coalition po ba kami sir? (did we forge a coalition sir? ),” Trillanes said. Trillanes added that his group, Magdalo, would not forge a coalition with the communists. “For as long as they (CPP) are killing our soldiers, talagang magiging tubig at langis ito (it will really turn into water and oil). Hindi talagang pwedeng paghaluin ito (It's really not meant to be mixed together),” Trillanes said. On the other hand, Pangilinan said while the communists desire to forge a coalition with the opposition, the Liberal Party (LP) has no desire to oust Duterte. “I will categorically state that there is no desire on the part of the Liberal Party to oust President Duterte. We will not support any unconstitutional move or approach. In fact, if you have any information on any member of the party involved, just tell us and we will expel this member because it is in violation of our Constitution,” he said.